At each wedding consultation, I tend to ask a lot of questions about your day. Sometimes it may take a couple of meetings and a few phone calls nearer the time of the wedding date to finalise all the details. This is a really important part of the process for both myself and the couple as it forms a detailed schedule of what’s happening on the day, enabling me to be really organised and for their day to run like clockwork. The next stage is to take a trip to the church and venue to check out the best locations for photos. This helps me to plan as I memories all the most stunning backdrops which will be suitable for photos. I asses lighting and make a list of equipment needed. One of my favourite chunks of the day is the bridal prep. I like to get creative using natural light and shooting from different angles to really show of all the details of the flowers, shoes, engagement rings, wedding rings, button holes, the wedding dress etc. Wedding couples put a lot of effort into planning every little detail of their wedding day, so it's natural that they want it to be perfect. Wedding photography should reflect this, giving them priceless memories to look back on. Of course, I haven’t forgotten the groom and groom’s men. 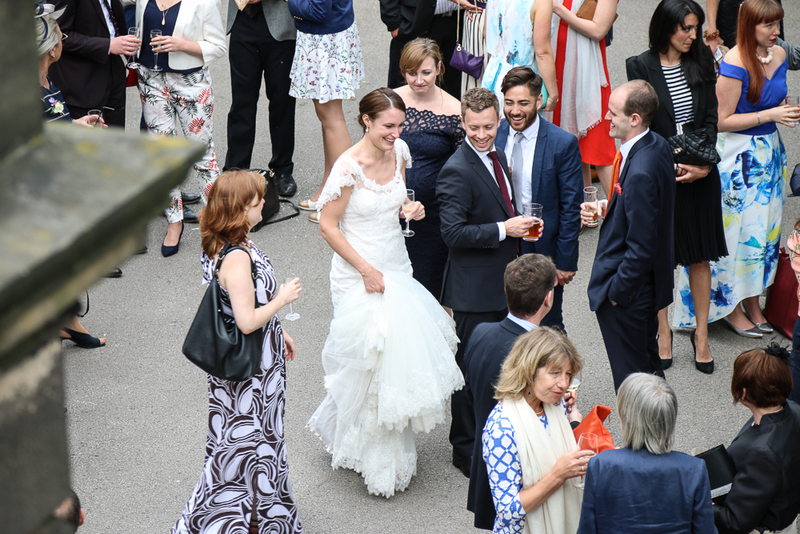 To make this part of the photo shoot relaxed, I suggest that they have a walk around the grounds, towards the church or plan to meet them at the venue bar. By allowing them some space, they naturally interact with each other, the banter starts to flow and I get snapping away. This way of working eases any tensions and gives a natural look to the photos. Once the groom and groom’s men are more comfortable with me we often share a joke which puts them at ease and enables me to take a few quirky style photos. Most wedding couples do want some formal group photos, so how do I achieve great, looking photos in place of stiff boring ones? The majority of guests don’t want to be hanging around for formal photos so the first thing I do is to gather all the guest together for a fun all guests photo. It's a great way to break the ice. This ensures no one is missed out and Its makes for a great photo as I usually shoot from high up from an open window or at the top of a staircase. It’s much quicker than lining guest up and I can capture everyone’s upturned face so everyone is happy. For couples who have requested a lot of formal groups photos, I make sure I’m well organised by referring to my schedule for details of the groups. This enables me to shoot in a fast and efficient way, allowing guests to get back to enjoying the wedding as soon as possible. Formal photos don't have to be ridged. In the photo example below, I asked the group to lean forward and get closer to the flower girl, this makes for a much more interesting formal photo. Once the formals are done and dusted, I move around the wedding party and do a bit of mingling. This way I can capture all the natural photos of people laughing and interacting with each other without being obtrusive. People are naturally chatting with others they get on with and so the result is, fun, relaxed and interesting photos. Often trying to stage photos with very young bridesmaids or page boys can result in them shying away from the camera for the whole day. Instead it’s best to document them naturally throughout the day. I can capture some quirky and fun, photos this way without them noticing I’m there. It shouldn’t take any longer than 30 mins to photograph the bride and groom’s romantic photos. Again, couples sometimes voice their concerns about this stage of photography, saying there’re worried it’s going to be to lengthy. The thought of staged romantic photos often fills couples with dread, that’s totally understandable, after all there’re not super models. In this instance, I give the bride and groom breathing space to walk around the venue grounds and have a chat, while I’m somewhere in the background with my long lens to shoot some beautiful natural shots. Let’s face it why would I ask the bride and groom to look at me and smile when they can be looking at each other. Here’s just a few testimonials from recent wedding clients. “We couldn't be happier with the photos Andrea took at our wedding at Hart's. “Well, I'm not sure how I can put into words just how happy we are with our wedding photos! Andrea captured so many highlights from our special day without us even realising, we were so comfortable in her presence and she soothed any nerves with her professional but personal touch. “Andrea was absolutely amazing at our wedding on Saturday she's has a lovely calming nature which makes you feel so comfortable while being photographed, she really takes the surroundings into consideration to give you the best of what you have, the quality of photos are brilliant. Making sure i'm well prepared before a wedding shoot is only a small part of the process. Understanding each and every couples requirments is essential for producing quality wedding photography of their day. My role when photographing a wedding is to anticipate what will happen next, be ready with my camera to capture all the fine details, the emotions, the laughter, the tears in a natural unobtrusive way.